December 1, 2016. 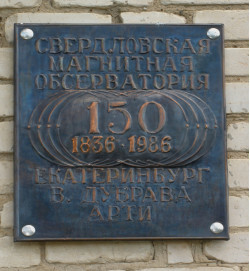 Geophysical laboratory-observatory "Arti", established and maintained by Geophysical Center RAS and the Bulashevich Institute of Geophysics, UB RAS, celebrates its 180th anniversary. Currently in the world there are thousands of geophysical observatories and stations on all continents and on the ocean floor. Stationary observations of geophysical fields play an important role in the study of near-Earth space, the internal structure of the Earth, as well as physical processes in its interior. "Arti" is one of the oldest observatories in the Russian Federation, preserved from the time of the Russian Empire. The observatory received its modern name only in 1971 after the listing of the Soviet network geomagnetic stations. Currently the geophysical laboratory-observatory "Arti" is a subdivision of the Bulashevich Institute of Geophysics, UB RAS. The observatory is located 180 kilometers from Yekaterinburg at the outskirts of a small town called Arti. Dr. Sc. Oleg Alexandrovich Kusonsky is the head of the laboratory-observatory since 1992.